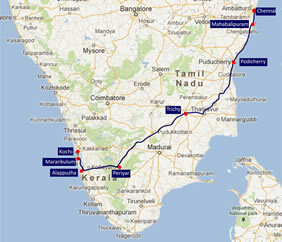 Chennai, Mahabalipuram, Pondicherry, Trichy, Periyar, Allepey, Marari Beach, Kochi, and more! See all this in the company of an international gay group, make new friends and enjoy the parties, including our welome and farewell drinks and dinner. Arrive in Chennai, India. Meet and greet. Transfer to the hotel. Breakfast at the hotel. Late-departure from the hotel for city sightseeing and then drive along the coastal road to Mahabalipuram. Mahabalipuram was the second capital and seaport of Pallavas – the seaport built by Mahendravarman during the 7th century AD. Lunch at a restaurant. Check-in to hotel and dinner. One of the prettiest metropolitan cities in India, Chennai perfectly mixes the elegance of past with the vibrancy of modernism. Marina Beach and Government museum complex with its outstanding collection of Chola Bronzes are some of the places that you will see. Along with a genuine blend of diverse cultures and people, the city is an attraction for tourists and travelers offering sandy beaches, parks, sculptures and historic landmarks. Breakfast at the hotel and proceed for city tour of Mahabalipuram visiting Shore Temple, Arjuna's Penance, Five Rathas (Chariots), Mahishasuramardhini, Mandapams, Mahishasura and Krishna, Salivan Kuppam and Sculpture Museum. Free-time afternoon for individual sightseeing, relaxing, swimming, massage etc. Lunch at a restauarant. Dinner at the hotel. 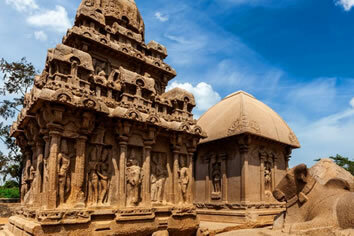 Located in the state of Tamil Nadi, Mahabalipuram is located right on the Coromandel Coast next to the Bay of Bengal. It was a well established sea port during the 7th and 10th centuries of the Pallava dynasty, and has flourished accordingly. 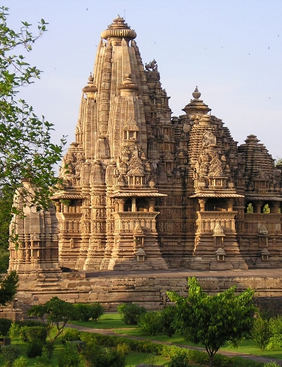 The area is brimming with rock-cut caves and numerous temples and is often referred to as an open museum. The area is also surrounded by beautiful landscapes - sandy beaches are plentiful along with casuarinas trees. After breakfast drive to Pondicherry. A small and quiet enclave of Tamil Nadu, Pondicherry has imbibed the Tamilian culture. This former French colony oozes a Mediterranean atmosphere with classy streets, stylish houses, oriental gardens, and is famous for pleasant weather and easy paced life. Visit Sri Aurobindo Ashram, Pondicherry Museum, Promenade, Bharti & Bharthidasan Memorial Museums. Lunch at a restaurant. Dinner and overnight stay at the hotel. Breakfast at the hotel and proceed for sightseeing of Church of the Sacred Heart of Jesus,Government Square, the Botanical Garden, Auroville, Thiruvannamalai. Free-time afternoon for individual sightseeing, relaxing, swimming, massage etc. Lunch at a restaurant. Dinner and overnight stay at the hotel. Reminiscent of French colonial rule and culture, Pondicherry is a prime tourist spot. Located on the Coromandel Coast, Pondicherry also offers interesting French architecture and cultural wealth. Pondicherry also has a great beach alongside the Promenade and has some ancient monuments. Breakfast at the hotel. Later drive to Trichy by coach. Trichy, located on the banks of River Kaveri has an ancient history before the Christian era. Arrive Trichy and check-in to hotel. Dinner at the hotel. Trichy is what the city of Trichirapalli is universally called and has been a city since before the Christian era. Thiruchirapalli’s most famous landmark is the Rock Fort Temple. Other sites are: Srirangam - The Sriranganathaswamy temple dedicated to Lord Vishnu is situated in Srirangam, 10km from Thiruchirapalli. This temple at 60 hectares with its seven walls and 21 gopurams is probably the largest and most sacred Vaishnavite temple complex in India. Lourdes Church built in 1896 is modelled on the neo-Gothic Basilica style from France. Breakfast at the hotel. Morning-tour of the city including Rock Fort temple and the largest temple of India, Sri Ramgan. Lunch at a restaurant. Afternoon-drive to Tanjore. Explore the city: Brihadeswarar Temple, The Palace, The Royal Museum, The Sangeetha Mahal, Archeological Museum, Darasuram. Return to Trichy. Dinner at the hotel. Between 10th and 14th century this Chola capital reached the zenith of its glory. 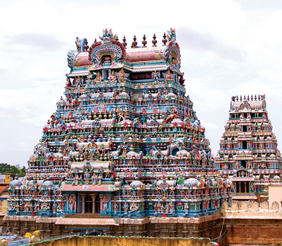 Thanjavur has about 75 temples and the most famous of them all is the Brihadeswarar temple. Rajaraja Chola built this magnificent monument of Chola architecture that is acclaimed as the grandest temple in South India. Breakfast at the hotel. Drive to Periyar. A short visit to the spice gardens – see the different spices grown in the area. Later check-in to hotel. Lunch at a restaurant. Dinner at the hotel. Breakfast at the hotel. Morning-tour at the Tiger Reserve including a boat trip. Lunch at a restaurant and dinner at the hotel. Located in Kerala on the Tamil Nadu border, Periyar National Park is one of the major wildlife reserves in the south. Situated on the banks of artificial Periyar Lake, the park is fully covered with dense forests and green grass lands making it an ideal place for wildlife such as the great Indian tigers, elephants, lion tailed macaques, gaurs, deer and sambars. Visitors can enjoy elephant rides and cruise rides on the lake. Nearby are spice gardens. Breakfast at the hotel. Drive to Alappuzha. Upon arrival board a houseboat and cruise through the backwaters of Kerala – on the way see traditional Kerala village life. Meals on board. Alappuzha is often called as “Venice of east” because of its numerous waterways. These huge networks of lagoons, canals, and lakes are the lifeline of the place. The best way to experience the Kerala backwaters is a short cruise by houseboat (also known as Kettuvallom). You will see merchants selling vegetables in boats while the village people wait at the bank on Venbanad Lake. Here your crew will prepare delicious Keralian meals from freshly brought vegetables and fish from the market. Return to coach and short-drive to Mararikulum Beach. Check into resort and lunch. Free-time afternoon for individual sightseeing, relaxing, swimming, massage etc. Dinner at the resort. Breakfast at the resort. Free-time full day for individual sightseeing, relaxing, swimming, massage etc. Lunch and dinner at the resort. 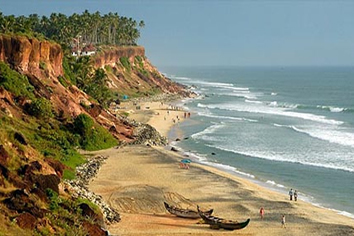 Marari beach in Kerala is a long untouched beach of golden sands and coconut palms. Here you will stay in a luxury resort offering massage, spa and Ayurvedic treatments. It is a place to relax and enjoy your beach break. Breakfast at the resort. Late-morning departure for Kochi. Check-in to hotel. Lunch at a restaurant. Free-time afternoon for shopping and sightseeing in Santa Cruz Basilica, the Dutch Cemetery, St. Francis Church, Jewish Synagogue, Mattancherry. Dinner at the hotel. Breakfast at the hotel. Morning-tour of city including harbor cruise. Lunch at a restaurant. Free-time afternoon for shopping and individual sightseeing. Dinner at a restaurant. Kochi is a vibrant city situated on the south-west coast of India. 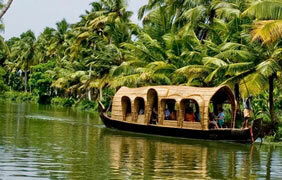 Informally, Cochin is also referred to as the Gateway to Kerala. From time immemorial, the Arabs, British, Chinese, Dutch, and Portuguese have left indelible marks on the history and development of the city. Cochin has emerged as the commercial and industrial capital of Kerala and is the second most important city on the west coast of India after Mumbai. Breakfast at the hotel. Free-time in the morning. Transfer to airport. Departure. • All meals included while on houseboat. • All city tours, sightseeing and transfers. • Services of an English speaking local guide at all places. • Experienced gay tour manager for the entire trip. This trip does not have any specific gay hosted events, meals or day tours due to the cultural sensitivity of this region. We will do our best to provide a safe, comfortable environment for you and your fellow travellers to experience this culture. Chennai is a sprawling city and has a developing gay scene, making it open and free. Chennai Dost is a major organization which organizes parties, film screenings, meetings, and also the Pride Parade. Chennai Dost has a pub dedicated for gays and bisexuals on Wednesdays called Diesel in T Nagar, and another location in Nungambakkam. A convenient 350 m from Egmore Railway Station, Fortel Chennai provides excellent facilities like a 24-hour coffee shop and room service. The 4-star hotel also offers elegant rooms with free Wi-Fi. Fortel Chennai Hotel is only a 12-minute drive from Marina Beach, while Kapaleswar Temple is 15 minutes away. Chennai Airport is 14 km from the hotel. Rooms are spacious and beautifully decorated. They are equipped with a flat-screen cable TV, a minibar and a work desk. Bathrooms feature bathrobes and a hairdryer for guests’ convenience. Guests can make use of The Fortel Hotel’s jacuzzi by day, and dance the night away at the nightclub located on site. There is also a fitness centre which provides for a refreshing workout. Be cradled in the lap of luxury and comfort, right in the middle of all the action in the enchanting little town of Mamallapuram. It is where history comes alive as the sun kissed beaches work their magic on your mind and body. With its own heritage of 25 years, Hotel Mamalla Heritage, lets you take a peek into the past, while you enjoy being pampered in the present! This property is 7 minutes walk from the beach. Hotel Mamallaa Heritage in Mahabalipuram has 3-star accommodation with a garden and a restaurant. Among the facilities at this property are a 24-hour front desk and room service, along with free WiFi throughout the property. A continental breakfast is available daily at the accommodation. At the hotel, all rooms have a desk, a flat-screen TV and a private bathroom. All units at Hotel Mamallaa Heritage have air conditioning and a wardrobe. Well designed with 22 centrally air-conditioned double rooms, and excellent facilities, the hotel is just five minutes’ walk from the Beach, Shopping Districts, the Vinayagar Temple, and Sri Aurobindo Ashram. An ideal location can work wonders for your holiday in Pondicherry. The Lotus - A Pondy Hotel is located in close proximity to all the major hotspots of Pondicherry. Situated on the Sardar Vallabhbhai Salai, near the Promenade Beach in White Town, our hotel offers signature hospitality facilities and services. Air-conditioned guest rooms are fitted with a work desk and a flat-screen TV with cable channels. The en suite bathroom comes with shower facilities. It offers a restaurant, free parking and free Wi-Fi internet access. Tulips Restaurant serves a variety of international dishes. Casino Hotel is 6 km from Ernakulam and a 10 minute ferry ride to Fort Cochin and Mattancherry. It offers an outdoor pool, 4 dining options and in-house Ayurvedic massage services. Free WiFi access is available. Air-conditioned guest rooms are fitted with a personal safe, a minibar and satellite television. The en suite bathroom comes with toiletries and a hairdryer. Guests can enjoy Ayurvedic treatments at an additional cost. Other recreational facilities include badminton.